Have you ever thought that your YouTube videos can help gather significant information on cetacean distribution and presence in poorly known areas? Over 500 people helped researchers in hellenic waters just by videotaping dolphins during occasional sightings and posting them on social media. With fewer and fewer funds available for environmental research, citizen science can help in many ways. In this case non-specialists collected data in the wild – whether they intended to or not. Researchers from Tethys and from the University of Thessaloniki, Greece, studied all geo-tagged YouTube videos of dolphins shot in greek waters they could track. A high consistency was found between this citizen science results and the available literature, leading to the conclusion that accessing videos uploaded to social media can be a reliable source of information on dolphin presence and distribution and a valid complementary tool to traditional research studies, particularly for areas with little prior knowledge and limited resources. Giovos I, Ganias K, Garagouni M, Gonzalvo J. 2016. 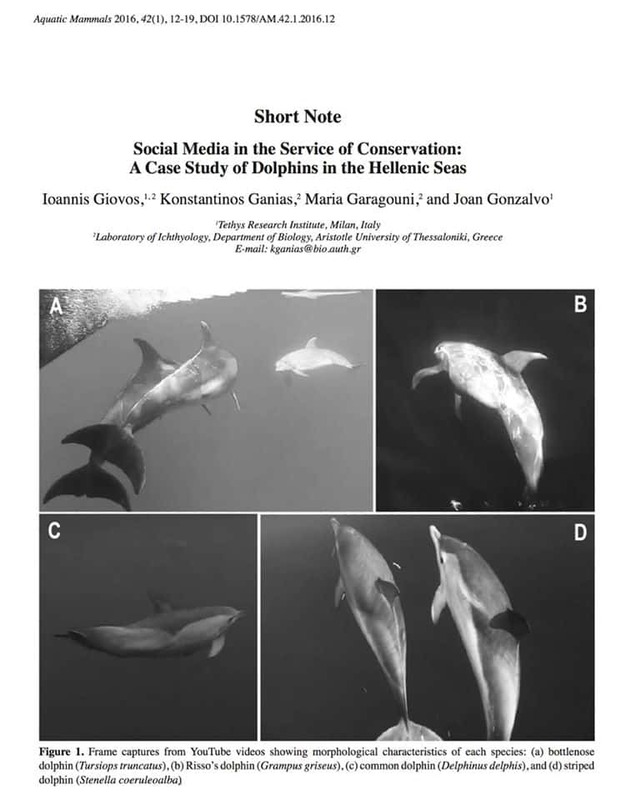 Social Media in the Service of Conservation: A Case Study of Dolphins in the Hellenic Seas. Aquatic Mammals 42: 12–19. Bräger Z, Gonzalvo J, Agazzi S, Bearzi G. 2016a. Identification of Bottlenose Dolphin (Tursiops truncatus) Prey Using Fish Scale Analysis. Aquatic Mammals 42: 63–73. Bräger Z, Moritz T, Tsikliras AC, Gonzalvo J, Radulović M, Staszny Á. 2016b. Scale morphometry allows discrimination of European sardine Sardina pilchardusand round sardinella Sardinella auritaand among their local populations. Journal of Fish Biology: n/a–n/a.